When it's B&W, it's ART ! There are a lot of big box stores and online printers that offer cheap canvas prints, but when it comes to your most treasured photos, Fromex insists on delivering quality. Your image is printed on thick 100% cotton, artist-grade canvas material, using our state of the art equipment with ultrachrome inks and media that ensure 100+ years stability. Each image is checked for optimum black and white density and contrast before printing, and a test proof is printed for your approval. 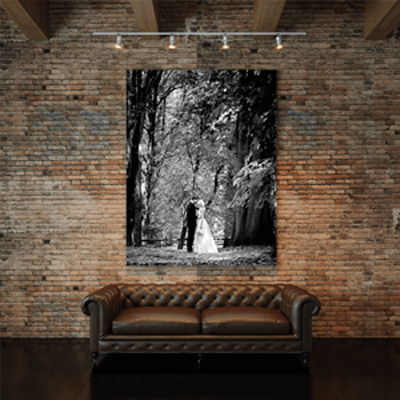 The finished canvas print is then coated with a UV coating to preserve and protect your image. It’s non-yellowing, waterproof, and adds additional depth and tone to further enhance your image. 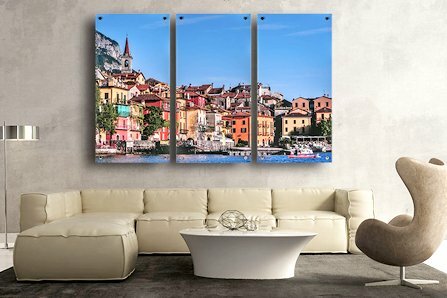 Our canvas prints are hand-stretched by a real human with precise attention to detail to ensure that your product meets the highest level of standards. Wall hanging hardware is included. 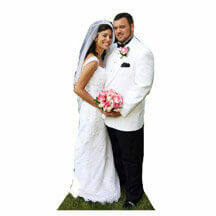 There are many options when you choose to have your photo printed on canvas. Our standard stretcher bars are 5/8" inch thick. This thickness is usually used when the stretched canvas will be put in a conventional frame. Our thick bars are the 1 3/8" thick gallery stretcher bar. This method does not require a frame, and highlights the image wrapping around the sides. Choose from an unprinted white border, printed black border or have your image wrapped around the sides! Wrapping the image requires special attention to detail before printing. We can print your image larger and wrap your actual image around the sides, or in cases where important detail would be lost on the front, we "mirror" your image at the edge and create a continuous image around the sides. The UV coating applied to the B&W canvas is in your choice of glossy or semi-gloss (we do not recommend the matte finish for B&W). This is included with any stretching order. Another option is to have one photo split between several canvas panels, or choose a cluster of different photos and different sizes of canvas for a stunning gallery wall! We can create a stretched canvas in any size up to 40" x 60". Standard stretcher bars come in almost any length, and we can make custom sized bars to any odd dimension for a small extra charge. Canvas Print Only (without stretching): Example: a 16x20 is $66.00, a 20x30 is $110.00, a 24x36 is $132.00, and a 30x40 is $176.00. All sizes are listed in our Price Book on page 11. Stretching: A United Inch (U.I.) is the length + width. Stretching with 5/8” stretcher bars is $1.00/U.I. Stretching with 1 3/8” stretcher bars is $1.50 /U.I. The UV coating is included with stretching and is applied to the canvas is in your choice of glossy or semi-gloss (we do not recommend the matte finish for B&W).